Tired of your sims having to buy expensive equipment just to workout in the comfort of their own homes? With this shiny new package, you can now get a good strength workout without the cost! -Realized that I am a hack programmer and was using the wrong set of .dlls to compile the code against. -Issues with the interaction not loading properly on sims has gone away (see previous point). -Reinstated the distance check, so sims won't work out through furniture and other solid objects. -Various other little nuances that may or may not have been noticed also went away with the bad code. -Now works with Patch 1.42! -Couch Potatoes can now work out at home, but they must be in a good mood. -Adjusted the tuning so that the interaction is only 75% as efficient for skill gain as using the workout bench. -Adjusted the tuning so that the interaction drains hygiene 50% slower than using the workout bench. -Adjusted the tuning so that the interaction takes twice as long to achieve the muscular shape as the workout bench. This is a new interaction that allows your sims to do pushups and crunches without the need for equipment. Athletic skill (as well as fatigue) still work, just like hitting the weight bench. Athletic sims can do this workout anywhere at any time. Less inclined sims can only do this workout in on their home lot or where there is a fit atmosphere, such as the gym. Couch potatoes must be in a good mood to work out. 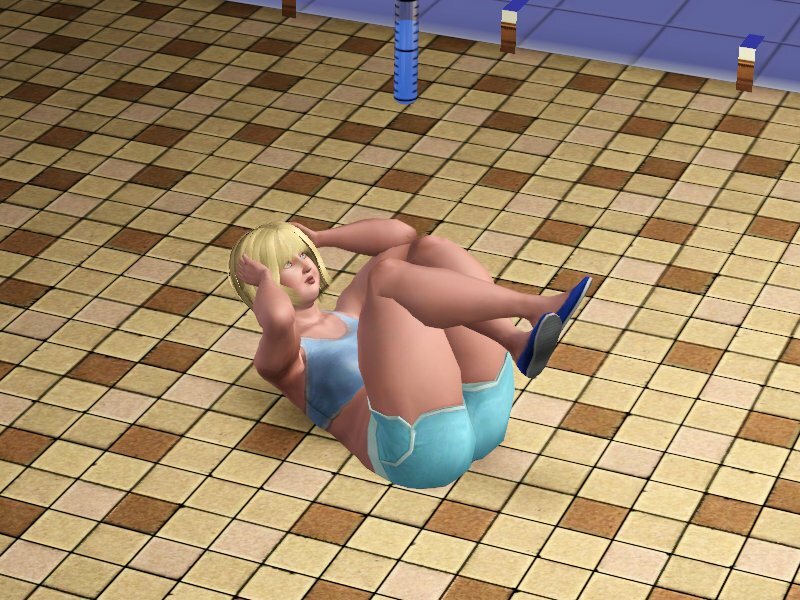 There are several different animations in this package, so when your sim is unskilled or tired, the crunches and pushups will start getting harder, and they will take some time to catch their breath. The interaction is (or should be) autonomous as well, so you might see some athletic sims working out in odd places, when the mood hits them. did not like the piece of code. Be aware that sims might do their work out through walls and nearby objects. Graphical issue only. but with how the EA code instantiates new sims, and as far as I can tell will affect all mods that inject interactions this way. Cherry, CyberBob, Nona, and MDM for guiding me through the coding problems. Wes Howe, CmoMoney and A for their work with Blender, which made custom animations possible. Peter and Inge Jones for the many, many tools and utilities created, and dedication to these projects. I hope I did not leave anyone out. This is a very large and helpful community.